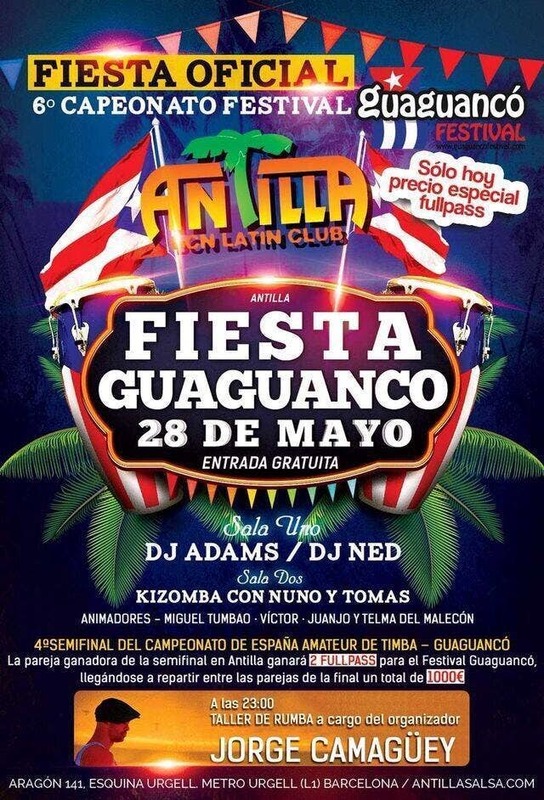 Antilla is pleased to invite you to a great night .... Thursday, May 28 GUAGUANCO PARTY OFFICIAL FESTIVAL !! We will start with a masterclass of rumba with JORGE CAMAGUEY. That night we celebrate the 4th Semifinal of the Spain Amateur Championship of Timba, where the winning couple will win 2 fullpass for Guaguancó Festival, arriving to be distributed among the partners of the final 1000 total € Spain. Room 1 with DJ and DJ ADAMS NED and animations Emilio Miguel Tumbao, Victor, Juanjo and Telma. In addition you can take to buy into that night at a special price of full pass for the festival. Room 2: kizombero territory with Nuno and Thomas ... karga !! Ne miss porq will be a great night !! !